Sugar detox seems to be quite the buzz word as of late. Many people are admitting to having a sugar addiction and are taking steps to fighting it: most of the time it’s with a detox. Wait, do I seriously have a sugar addiction? In my recent post with step-by-step guide to surviving a juice cleanse, I mentioned that I started working with a holistic health coach. The truth is – I have been feeling more and more at mercy of sugar. The holidays were filled with overindulgence but it seemed like the more I thought about the feelings and the cravings I felt, the more I realized that this is just NOT NORMAL. I mentioned that my mom suspected candida, but I don’t want to go that route. Fact of the matter is – I have intense and sometimes overwhelming cravings for sugar. I know my metabolism is slow because I am frequently cold, fatigued, and just overall feel lazy. Winter weather surely does not help and it might be giving me a little bit of a case of S.A.D. Regardless of the circumstances, I knew that this is not the way I want to keep living. I’ll admit – I was jealous of my friends and their apparent restraint when it comes to food. I mean – Who is able to bake a batch of brownies and have them last her a whole week (whereas I could devour the whole batch in a day or two). How can you eat ONE BAR of chocolate over a course of a week?! I don’t get it. HOW are you able to do that when it is right there, staring at you?! I just don’t get it. While I hate the term ‘sugar addiction’ – I will use it for the sake of this conversation. I cringe when I hear it, write it, and think it – because it sounds so ridiculous. Being addicted to something that most people in the world view as delicious, happy, and bright is just… sad. Maybe it’s a legit addiction or maybe it isn’t. Regardless of what the proper term is – having way too much sugar and feeling like you cannot control your sugar intake IS A PROBLEM. When speaking with Carly, we touch on many topics – from relationships, to spirituality, to food and exercise, and more. That’s the beauty of working with a holistic heath coach, we talk about it all. Getting in shape or even feeling fulfilled by life is not merely about the food, there is so much more that goes into satisfaction with life. And that’s why I’m glad to be working with a person who understands that. I was told to keep a food journal for two weeks to notice some patterns in how I was eating, how I felt after, and so on. I did that. Being the crazy data-driven person that I am, I created a comprehensive spreadsheet that was filled with all types of information: like my hunger level before and after eating (props to intuitive eating for that one), my reason for eating (physical, emotional, etc? ), what I ate, and notes/feelings I had after eating. I eat emotionally very frequently, especially when I don’t have things to do after work and I feel like I just want to be comforted and excited. I’ve been using food as excitement. I eat some type of sweet food most of the day, whether I realize it or not. After some discussion about blood sugar and sugar addiction and how certain foods, such as grains, affect our body inside was very eye-opening. Carly shared some research and empirical articles that spoke to how carbs are treated by the body – converted into sugar and the crazy effects that sugar has on our body from a physical and mental standpoint. It was apparent, based on what I was saying and what my food journal showed, that I have an addiction to sugar. It’s there. It’s been there. And I may sometimes think I have it under control until it comes out of nowhere and takes a total hold of my life. The thing with beating a sugar addiction is that in order for it to be permanent – it has to happen gradually. It is not sustainable to just quit sugar cold-turkey as it can lead to a lot of whip lash in the form of negative side effects and just plain feeling like you’re going crazy. Surely that can lead to a big binge at the end of such detox but again that’s just a speculation based on my prior experience with food restriction. That is the reason why I will not be doing the 21DSD at this time even though I have the book (although I am totally gonna be making many of the recipes that are included in there as well as using the book as a reference and guidance for some points). Carly told me that the best way to start overcoming my sugar addiction is to put off my intake of sugar as late into the day as possible because apparently, I had been feeding my body sugar from the very start of most days – which could explain why my sugar cravings get more prominent and stronger as the day progresses. So the first step in beating sugar addiction is to focus on NOT having sugar for breakfast, whether it is in legit sugar form or in a form that converts into sugar in the body. The goal for the next two/three weeks (until our next meeting) is to make sure I have a no/low-sugar breakfast every day. Additionally, it’s important to remember that if I do have a sugary breakfast once in a while that is not considered as falling off the wagon and that is totally OKAY. The 90/10 mentality is one that should be implemented as it is more realistic – let’s be real, life is no fun without a nice treat sometimes. These are all things I have eaten for breakfast before and they may have been contributing to my stronger afternoon/evening sugar cravings. There’s a good amount of things I am able to eat and I created a meal plan for breakfasts for the next week so that I can know what I will be eating each day. I tend to just be confused most mornings and end up making a protein shake or grabbing something quick (like protein bar or cereal) so this will be a good way to be more prepared. Based on the things we are discussing and some of my recent dietary needs changes, it seems like I will be gravitating toward doing a sort-of paleo-ish lifestyle (but not really). Although there is no label for what I will be doing – the thing is, I will simply be leading a nutrition-based lifestyle that is kind to my body, my mind, and my spirit. I will talk more about that as it begins to take form and I get a better hold on it as time progresses. Stay tuned. I’m hoping that this change will help my sugar cravings. I’m excited to continue with this and report back next time with the next change. Make sure to subscribe to my newsletter to stay updated with how my health coach calls are going and the progress! Do you get sugar cravings? What for, usually? Oh gosh I love sweets too! I don’t eat regular refined sugars, only maple syrup or coconut sugar seldomly, but I know that’s still technically sugar. I have always loved sweets, always since I was a kid. It’s weird too, because neither of my parents were like that growing up and didn’t feed us bad. I start my day off everyday with a superfood smoothie and some toast and almond butter. It’s healthy and makes me feel fantastic everyday. I don’t crave sweets all day long, it usually hits me at night. I’m pretty good at easily controlling it though. I don’t know of an emotion I relate it too either… I just simply love the taste, haha! Wow! I totally needed to read this! Thank you so much for posting about this!! I LOVE sugar and have to have it EVERY day, multiple times a day. I’ve thought about doing a sugar “fast”, but I’m so nervous about it!! Thanks for sharing this with me! No problem, Megan. Like I mentioned, a detox may not always be the best idea – it’s about what you think would work and be sustainable for you. Not that detoxes are bad if you think you can handle it. It all varies from person to person. What was the “fast” you thought about doing? how many days? Interesting…I’ve been eating a sweet variety of oatmeal for breakfast nearly every day for 2+ years now. I understood that to have something naturally sweet in the morning helps to satiate the sugar cravings (my mouth is FULL of “sweet teeth”!) later in the day. Lunch is savory and usually grain-free with some exceptions, and dinner is about the same. I also eat tons of fresh fruit and veggies throughout the day. I’ll be interested to see how you do! Ah well it sounds like you have your sugar intake under control. There is no right or wrong way to eat, I think – it’s all based on the person. If you can eat something sweet for breakfast and still be able to just eat normally the rest of the day then that’s awesome and I wish I could say the same. I found that if I start the day with sugar, I tend to crave sugar a lot more throughout the day too. I’ve made the mistake of eating brownies and cookies and cake for breakfast many times (leftover birthday brownies anyone?) – bad decision. Couldn’t stop. I’ll be sure to keep you updated with progress. Is there anything in particular you’d like me to mention in future posts about this? Raises hand: Sweets addict here. Thanks for sharing this information. I was under the impression that oats were a great way to start the day…perhaps it’s all in the type of oats you make? Like, what you put in it? Maybe I need to rely on eggs more, which I also love. The reason for oats is because it’s a grain. There is a bunch written about it and that is contains antinutrients which prevent all the minerals from being absorbed by the body. I don’t know that much about it, I just started reading about it. My health coach recommends minimizing all grains and trying to go with the 90/10 philosophy. 90% of the time no grains and the rest, ya go ahead. She does say that sprouted grains are fine though. Oats are not sprouted. Great information! Thank you so much for sharing it on the Daily Blog Boost today! Pinning! I’ve been detoxing all throughout the month of January and I feel so much better! Basically, getting rid of the sugar from my diet has stopped the cycle of craving junk food in general. Sugar is such a drug and not just desserts but carbs that turn into sugar. That’s absolutely it! You nailed it. I’m glad to hear that it has been working for you, I’m hoping this will be the same type of thing for me. that’s really interesting about not having sugar until later in the day – i want to try that because i have a mad sweet tooth by the afternoon! Oh my gosh YES to all this. I pretty much grew up with a sugar addiction and am still struggling with it, on and off. You really hit the nail on the head with your new breakfast choices. I actually just did (still continuing) a 7 day breakfast challenge where I ate something different every morning (no shameless blog plug I promise but check out the post if you want some breakfast inspirations/ideas!). I quickly discovered that breakfasts featuring eggs, cheese, and meats (and avocado 🙂 ) balanced my appetite SO well throughout the rest of the day. While I love waffles and oatmeal, I found they didn’t keep hunger away for long and my appetite zig-zagged all day. Good luck girl, I can’t wait to hear about your results and discoveries! What a smart idea. I am actually going to be starting a sugar detox starting tomorrow and think the no sugar for breakfast thing will seriously help. Thanks! Another sugar fiend right here! Trying to take control of my cravings day by day. Thanks for sharing at the DBB! I usually have eggs at breakfast and perhaps an orange or some berries. If I want something sweet, I find that almond butter usually fills the bill. Good luck to you and stay with it… I am sure you will feel better! Oh girl, I’ve had it bad every since pregnancy. Too much ice cream! I don’t know that I could give up oats n’ such for breakfast though. It still seems totally more doable than going cold turkey though. Good luck! Great post. The sugar in the morning thing definitely will help me–I tend to reach for a tiny bit of chocolate or whatever whenever I wake up. Bad habits. 🙁 But the tips in this post will hopefully help me get back on track! Good luck Rosa! Make sure to check back with more tips I learn from Carly and things I find that help me as well. 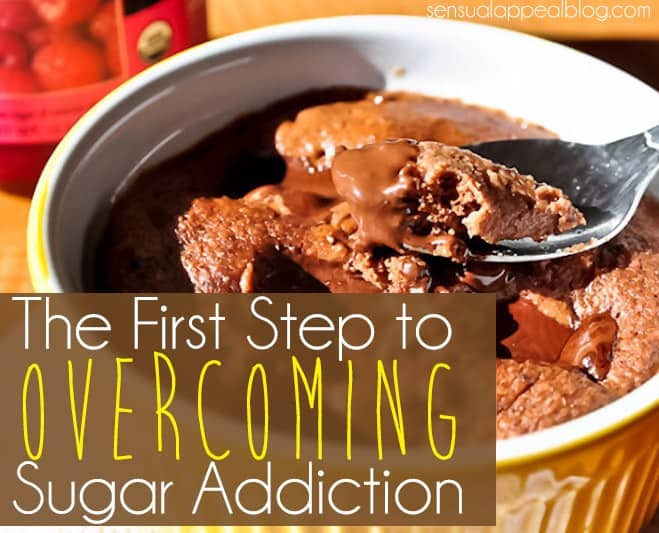 Let’s get sugar addiction conquered together once and for all!